So this is a bit special, we are going outside of the US for this one! Back in May, my good buddy Yum decided he knew the perfect birthday present for me: Beer. He was right. I was presented with this gorgeous and crisp box that said “Product of Scotland” on the back, a cool hand designed label on the front, and “LIMITED EDITION” printed in big letters at the footer. I wanted to save this one for when I really had time to sit and enjoy it with no distractions, and I am pleased to say that tonight is that time. 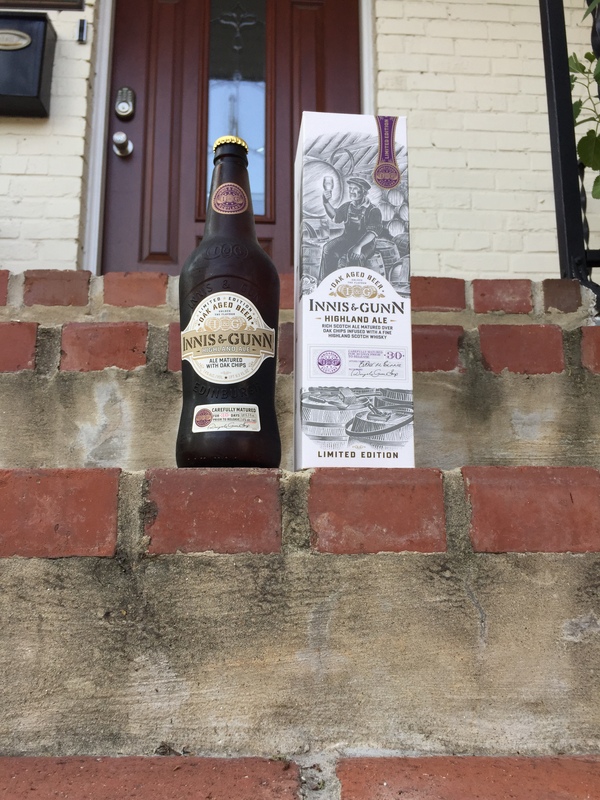 This is the Innis & Gunn Highland (Scotch) Ale! First off, the box is a very nice presentation; it definitely makes the experience just feel all around more special (like getting a new bottle of Scotch). Once you get it out of the box you see a nice ‘shapely’ bottle that is refreshingly understated. While this isn’t as simple as a bottle of Bud Light Lime at the ballpark, there are very few bells and whistles going on with this presentation. The whole experience is kept very adult and low on gimmicks. 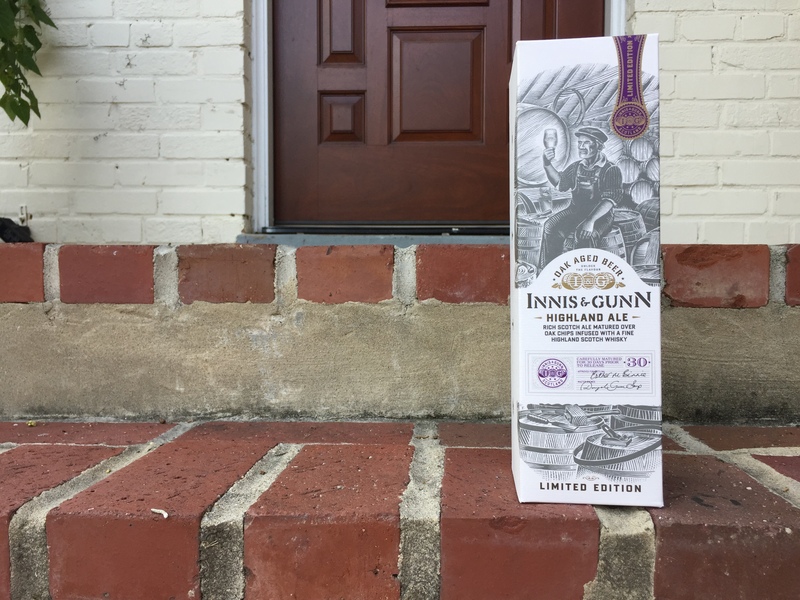 The bottle is attractively embossed and the only extra labeling is a small info label with the alcohol content, fluid amount, and signature of the master brewer. Once poured it is a very handsome amber with a predictable and manageable ivory head. With very little to know sediment, it looks like that perfect put that you see in catalogues. As the box promised, the scent of raisins is rather discernable, however this is quickly overtaken by a much richer caramel/honey scent. I will say that a lot more of this scent can be appreciated on the exhale after taking a sip. It’s not an exceptionally fragrant pour, however to me, that is a good thing. I stepped outside with the glass freshly poured and the combination of that, with my neighbor barbequing, and just general ‘nature’ smell was so euphoric. I am SO glad I wasn’t let down here! Scotch Ales have such a tendency to be so over powering that you can’t finish a pint, let alone a pint plus 6.3 ounces. The Highland Ale does not have that issue. Damn is it smooth. Damn. I really am trying to find something negative here, guys. It tasted of malt, vanilla, and definitely oak. 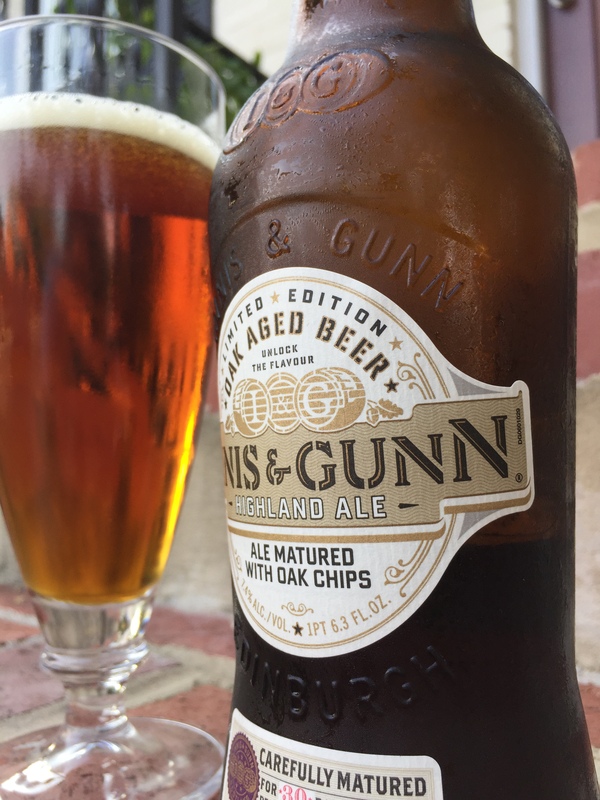 If you’re ever having trouble describing the taste of oak to a non-beer drinker – this is the one to exemplify because you feel like a damn lumberjack working late who forgot his lunch that needs to go full beaver on the nearest stump! But in all seriousness, sweet, full bodied, and a solid drinkability factor – it’s a homerun! I don’t think I said one negative thing about this beer. It really is amazingly solid. It’s definitely not American, you can taste that right away; that is not to say it is better or worse than an American equivalent, just obviously different. I am immensely pleased and surprised with the Highland Ale. I guess if I had to be critical I would say that I, personally, would like just a little bit of bite on the back of the tongue – it is creeping in on almost too smooth, but maybe that’s just me. Way to go Scotland. And way to go Yum!! You picked a good one!